Rating: 4/5 – The 1969 Revival of The Phantom Stranger & Dr. 13. The Phantom Stranger first appeared in 1952. With a tagline exclaiming “Is He Man…or Ghost?”, the series was an anthology that ran for six issues. 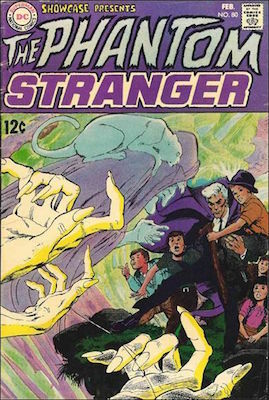 Created by John Broome and Carmine Infantino, Phantom Stranger’s original series didn’t last long. He was in comic book limbo for 16 years until he was revived in the eightieth issue of Showcase, cover dated February 1969. Phantom Stranger’s origin has always been a mystery, so much so that until the New 52 version of the character, he’s never really had a true and definitive origin. He’s always been associated with religious origins, which were taken one step further in the New 52 by revealing him as Judas Iscariot, with his silver necklace signifying the thirty silver coins. I much preferred the mysterious origin rather than the one presented in the New 52, and you can read about that character in this issue, and his solo series that began a few months later in the late spring of 1969. There are two stories in this issue, both of which were originally told in DC’s Golden Age titles, The Phantom Strange and Star Spangled Comics, but contain all new framing sequences that introduce the two characters to the readers of 1969. Despite them being reprints of stories from the early 1950s, I enjoyed each of them quite a bit! The first story is titled “The Three Signs of Evil” and has the Phantom Stranger tracking down a group of evil cultists who have used signs to signify three mystic regions in New York. The art by Carmine Infantino is great to look at, especially some later scenes that have the cult members shrouded in heavy greens attempting to sacrifice their victim. Although this is a Phantom Stranger comic, the second story stars Dr. 13. Again, framed with all new art by Jerry Grandenetti that reprints the first Dr. 13 story from Star Spangled Comics #122, November 1951. In this tale Dr. 13 is investigating a home where his father would speak to him from the dead, five years after his death. Dr. 13’s mission is to explain the seemingly mystical by proving that there’s a reasonable explanation for most everything. So with that origin, his convictions are put to the challenge before the story is out and it was great to see his origin since I’ve never read it before. Of course the story has a twist ending like most “horror” comics of the time, and although it was a tad goofy, I still enjoyed the issue and the final framing sequence that has Dr. 13 trying to explain the appearance and disappearance of the Phantom Stranger. Showcase number eighty also has a gorgeous cover by Neal Adams that almost makes this worth buying for that image alone, but add in two stories from the golden age and a beautiful new framing sequence by Grandenetti and you have a must buy back issue. I was able to pick this comic up at this year’s C2E2 for about $30, which I consider a bargain, considering the Adams cover and the revival of one of DC’s more interesting characters. This entry was posted in comic book, comics, DC, DC Comics and tagged Carmine Infantino, comic books, comics, DC Comics, Dr. 13, Jerry Grandenetti, John Broome, Phantom Stranger, Showcase, vintage comics. Bookmark the permalink.